At Eagle Cross Kennel we are Goldendoodle breeders and we strive to provide healthy Goldendoodle puppies with good temperaments to individuals or families desiring a pet. Eagle Cross Kennel also provides stud services. We service customers throughout the United States, Canada, and South America. As goldendoodle breeders of, F1,F1B,& F2 goldendoodles, we strive to give your family the best goldendoodle possible. Our kennel prides itself on breeding and raising , Goldendoodles, Labradoodles, AKC Golden Retrievers, AKC Standard Poodle breeds. Our first concern is to provide you with a healthy, problem-free dog of your choice. As breeders of Goldendoodles and Labradoodles, health is of the utmost importance to us. 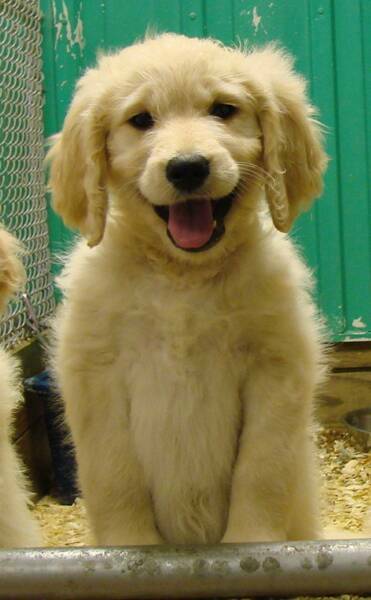 We are aware of the conditions of Hip Dysplasia, eye and skin conditions in Golden Retrievers. These conditions are directly related to the breeding practices of many backyard breeders who are concerned more about financial gain rather than the health of your new puppy. We make health the number one concern in your new puppy. We are continually enhancing our knowledge and understanding of these conditions. Our second concern is breeding for temperament. Attitude, socialization, and hands-on care are major factors in how your dog adapts to your family. MEET "GROVER" ONE OF OUR DOGS THAT ARE IN SERVICE!! Copyright 2009 Eagle Cross Kennels: All rights reserved. CALL US ; 330-519-7757 FOR INFORMATION ON OUR BREEDING PROGRAM! What do you get when you mix two of the most people-friendly, intelligent dog breeds, the Golden Retriever and the Poodle? You get the Goldendoodle, of course! We absolutely love our sweet and friendly Goldendoodles. Once you learn about them from our website, I am sure that you will love them just as much as we do. 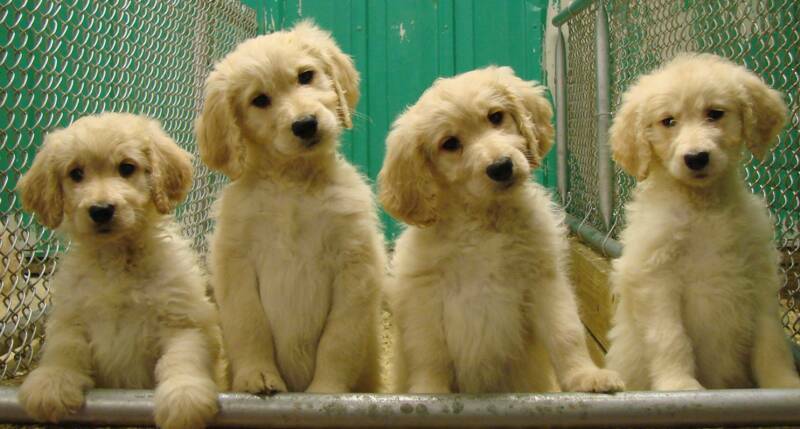 Goldendoodles and Labradoodles are an intelligent and obedient family companion. They are everybody's friend and devoted to their family. They are friendly towards children, other dogs and pets, and easy with strangers. They are extremely social dogs, happiest when they are with people. Their intelligence, eagerness to please, and love of learning make them very easy to train. Goldendoodle puppies learn quickly and do well with positive enforcement training. Their willingness to please their owners enables you to train without treats! We have been committed to the development and research of Goldendoodles for the last eighteen years. We are a Professional Goldendoodle and Labradoodle Breeder that specializes in the most outstanding Labradoodle and Goldendoodle puppies for sale in the world. Eaglecross Kennels has a reputation for producing beautiful, top quality Goldendoodles that are smart, healthy, happy, well tempered, gentle and extremely laid-back. 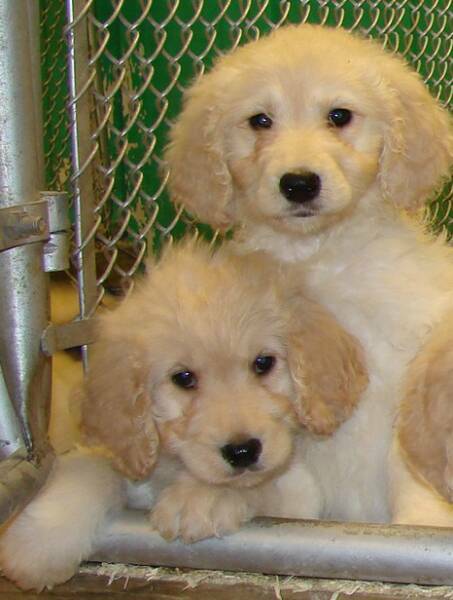 Our Goldendoodles have been placed with families all over the U.S. and Canada. Due the growing popularity of our Goldendoodles and Labradoodles, we also schedule confidential pickups for our celebrity clients at a private location on our property. Our goal is to produce a specialty line of Goldendoodles, and Labradoodles for therapy work, with beautiful boxy heads, and low to non-shedding coats. We realize that many people these days are allergic to dogs and our goal is to produce dogs for people with dog allergies. While no dog is 100% hypoallergenic, there are many breeds which the American Kennel Club (AKC) recommends for people with allergies. Some of our dogs are produced from breeds that have low to non-shedding coats which produce less dander. People with allergies are actually allergic to the dander, not the hair. Based on our client’s allergy trials we have goldendoodle puppies for sale that have proven to be Hypo- Allergenic Dogs / Non- Allergenic Dogs. These dogs are available upon request. We can schedule a test visit to determine if one of our puppies would be a candidate for your particular allergy issues. Eaglecross kennels prides itself on paring up puppies with all issues in mind, allergies, lifestyle, and activates for each client on a personal level. We can also provide specially trained Therapy Goldendoodles with Dog Builders of Chicago for people interested in doing therapy work. Our goldendoodle puppies for sale are currently being used in hospital therapy work in several Chicago hospitals. We also have goldendoodles with the Assistance training program of Toledo. We have placed goldendoodles for assistance training in the Toledo Correctional Institute for service work. This program works with prisoners within the institute, rehabilitating prisoners and developing dogs for service work. We also have several dogs that work with the Heritage Foundation for Autistic children in South Carolina. We breed the Standard F1, F1B, F2 Multi Generation Goldendoodles, and the Miniature F1, F1B, Mini-Goldendoodle. The colors vary from Ultra Cream, Parti , black, red, apricot, med golden . Our breeding dogs are from some of the best lines with many champions in their bloodlines. We do hip, heart, eye and DNA testing on all of our parents. We offer a full two year health guarantee on all of our puppies, and a life-time of support and re-home/rescue assistance if needed. Our puppies have current health records and are available for lifetime shots at our kennel. All puppies are well on their way to being crate trained when they go home and have all been well socialized with children.